One of the reasons fans hated The Amazing Spider-Man 2 so much is that it spent nearly all it's running time trying to set up the massive super villain team-up movie The Sinister Six. It didn't have time to concentrate on Peter Parker and Gwen Stacy. The spinoff movie was being prepped for a 2016 release date, with Drew Goddard set to write and direct the film. But when The Amazing Spider-Man 2 failed to live up to both box office and fan expectation, Sony put all of it's Spider-Man inspired films on hold. In stepped Marvel. And the rest is history. The slate was wiped clean, there would be no The Amazing Spider-Man 3, with Marvel and Sony instead collaborating on a Spider-Man reboot for 2017. Also scrapped was The Sinister Six. But Drew Goddard claims the movie is not dead yet. The Sinister Six is not beholden to The Amazing Spider-Man 2, even though that film set up the many villains the spinoff would have utilized. The fact is, the script as it stands, is a one-off. Drew Goddard compares it to the Marvel summer annuals that were popular in the late 70s and early 80s. It has one story that does not connect to anything else. And with a few tweaks, it could fit into what Marvel has planned for the character. It works on its own, and if Marvel wants to do it, it will be done. Just not for a few years. Sony is still planning to create Spider-Man spinoffs in collaboration with Marvel Studios. That plan has never changed. And they've even officially announced a Spider-Man Animated Movie, which will follow the upcoming reboot in 2018. The Lego Movie and 21 Jump Street directors Phil Lord and Chris Miller are attached. There was also at one time talk of an all-female Spider-Man spinoff and a movie focused solely on Aunt May, a character that will now be played by Marisa Tomei. 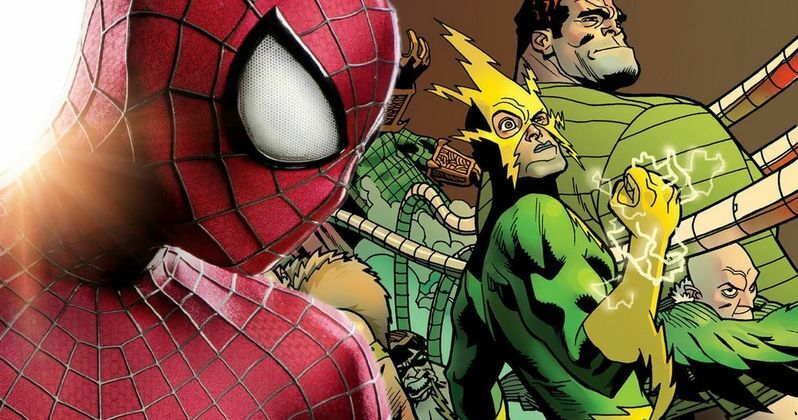 It's still very possible that The Sinister Six could follow the Spider-Man Animated Movie in 2019 or a Spider-Man sequel in 2020. The end of the decade really isn't that far away. And the studio has also really wanted a Venom standalone movie. Drew Goddard is best known for writing and directing the cult horror hit The Cabin in the Woods. He also helped creatively with Marvel's Daredevil, writing the first two episodes. But he backed away from being a Netflix show runner for Sony, aiming to helm The Sinister Six. And it's The Sinister Six that remains his passion project. Speaking with io9, the director and writer explains his intent for the spinoff, and reveals that he's as hopeful as ever that it will get made under Marvel's watch. "My vision of that movie was a summer annual. So you didn't have to worry about continuity. It was just, 'We take Peter, put him on an adventure, we put him back in his life.' I intentionally wanted a movie that didn't have to worry about mythology and continuity. It was important to me to make a movie that could stand on its own. So the good news is, you know, [laughs], it slots in very well to any plan anybody ever wants. We just need to let a couple years go by, I think." While some might think that Drew Goddard had a bit of ill will towards how everything went down, that simply isn't true. Sure, he was disappointed that his movie, which was almost ready to go into production, got halted at the last minute. But he thinks it's all for the best. Spider-Man truly belongs inside the MCU. There's no other place for Peter Parker. The Sony and Marvel partnership was a must, he says. "The tricky part about all this is I love this plan. I love that you get to see Spider-Man in Marvel movies. I think that's a great thing. I'm on board with that decision because as a fan that's what I want. So who knows what the future holds? This is Hollywood, man, you've gotta play the long game." Tom Holland will now star as Peter Parker in the Spider-Man reboot, set for 2017 release by Marvel and Sony. But first, the actor will make his debut appearance in the Disney and Marvel sequel Captain America: Civil War. In that film, he will have an extended cameo and fight scene rumored to be one of the greatest ever seen in the comic book genre. Jon Watts is directing the standalone movie, with Vacation reboot writers John Francis Daley and Jonathan Goldstein scripting the adventure. Hopefully the remake is a success. It will mean we may actually get to see The Sinister Six happen under Marvel's watchful eye. Is Spider-Man: Homecoming Setting Up a Sinister 6 Movie? Spider-Man Reboot to Include Iron Man & Sinister Six? Ryan Gosling Wanted for Ghostbusters & Sinister Six?